PowerX2011™ advanced telecom server is an intelligent multi-channel communication server that not only incorporates all the functions found in a sophisticated telephone system such as a PABX with its advanced add-ons but also much more advanced, useful and unique features in a single, compact, low cost, easy to maintain and completely integrated platform. It is a network ready telecom and computer telephony server providing telecommunication & computer telephony integration (CTI) such as advanced PABX switching, intelligent automatic call distribution (ACD), conversation recording, call details recording, auto attendant, unified messaging, interactive voice response (IVR) system, text-to-speech and speech recognition technology, least call routing, voice-over-Internet-Protocol (VoIP), SMS, Email, Fax, internet chat and more. It is designed to be an open and flexible system which can be customized and integrated with other applications to meet specific market demands including online real time transaction processing through the use of IVR, credit card payment processing, real-estate property listings, internet chat, internet call, Contact Centers, etc. PowerX2011™ telecom server is the most modern, open, flexible and universal telecom server. 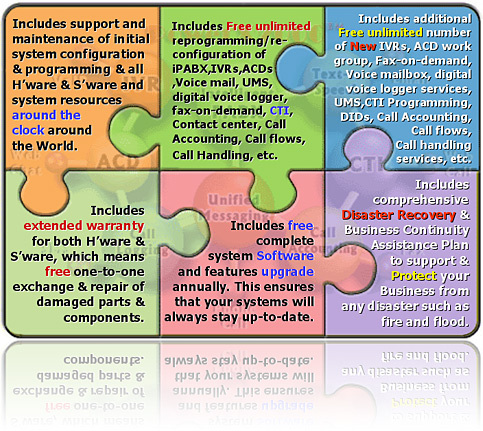 As all the advanced telecommunications and computer telephony features are designed to work together as an all-in-one total communications solution, it removes the necessity to purchase several systems such as PABX, Key Telephone System (KTS), voice mail, auto attendant, IVR, call accounting, conversation recording, CTI server, ACD or unified messaging. It serves as a foundation for CTI seamless integration with the PowerX Relationship Management Platform and other Customer Relationship Management (CRM) applications in the market to deliver a state-of-the-art total communication solution. Independently, the PowerX2011™ telecom server provides true end-to-end CRM capabilities without the need to integrate multi-vendor subsystems to the traditional telephone/PABX system. Unlike the traditional PABX and ACD systems, the PowerX2011™ telecom server extends beyond incoming and outgoing calls. It not only empowers all functions of a sophisticated traditional telephone/PABX system to be configured and managed from a single graphical user interface (GUI) of the computer, it also links the switches of the computer to manage the flow of information between the telephone and the computer. It handles most types of communication channels such as voice calls, voice mail, internet calls, web chat, SMS, fax and email by intelligently queuing, distributing and tracking each type of communication events to Automatic Event Distribution workgroup(s). This feature helps agents to multi task customer requests using different communication modes, track responses and service levels for each type of communication channel and improve productivity. It also applies intelligence to phone call handling to automatically add relevant data, fax, graphics and/or video to voice communication. The PowerX2011™ telecom server is also a comprehensive contact management center offering a complete range of solutions. It is fully scalable and designed to meet the operational needs of businesses from small enterprises to large multinational corporations and Contact Centers. The system comes complete with the latest telecom, optional computer telephony and IP technology and features its own unique and powerful computer telephony application. Like its open design software, its operability and growth is not constrained by any hardware. The PowerX2011™ telecom server can be deployed at a cost of at least 50% lower than any traditional PABX solution. There is no duplication in hardware resources and no third party system involved in providing even sophisticated telecommunication features such as Short Message Send service (SMS) broadcasting and CTI capabilities. With the PowerX2011™ telecom server, there is also no duplication of software resources; one fully integrated platform for all features . It is 100% compatible as the hardware and software are built from ground up to match and work with each other. The user is not locked in to proprietary equipment as the PowerX2011™ telecom server supports all standard caller ID handsets. As free software upgrades are provided during the maintenance period, all customers enjoy the latest available software features and this increases the lifespan of the system. There are no multi subsystems to deliver advanced telephony features, which limits hardware parts for maintenance and upgrades. It is scalable to 5,072 ports (Trunks + Extensions) and can be cascaded to provide as high as 50,000 ports. There is no restriction on the number of available voicemail ports, conversation recording ports, ACD groups/members and IVR menus as the PowerX2011™ is designed based on powerful one-to-one allocated resources unlike limited shared resources in traditional telephone/PABX solutions. It leverages on the power of the industrial 19” rack mounted computer, together with the latest communications technology, to maximize company’s productivity and control costs. It is fully expandable. As the PowerX2011™ telecom server is mostly managed by its powerful software, there is no additional floor space required for incorporating new features. Its modular and open system design enables tremendous flexibility in customization and creation of powerful unique solutions. The PowerX2011™ telecom servers in the main building and annex can function as a unified PABX system or split into a few independent systems. In the event of physical relocation of a major division, the servers can be split up into more than one standalone or integrated system. There is no need to purchase additional PABX system to support the division that is relocating. There are lower maintenance costs as there is only one platform to support and customize. There is only one point of contact for support and customization as there are no multiple vendors to deal with. There is less reliance on vendor to implement minor changes to system configuration. Graphical based administrator module empowers any trained IT staff/administrator to make changes to system configuration, design new IVR menus, etc. Continued support is not an issue as the PowerX2011™ telecom server uses market available standards such as Ms WindowsÒ based interface, standard analog and/or featured handsets, Crystal Reportsâ and ODBCâ compliant databases for CTI. Since the system is compact and mobile, in the event of disaster, telecommunication services normally resumes after a few hours . Also a low cost redundant system can be deployed easily. A loan system is also made available in the event of disaster. The PowerX2011™ telecom server has a built-in interface which can directly link to any ODBC compliant database and/or CRM/ERP system to deliver services such as screen popups, reading/updating transactions such as account balances, etc. The system is designed to manage multi-channel communications; voice calls, voice-over-IP calls, SMS, fax, email, web chat and video conferencing. It allows for multi channel broadcasting and notification services. It also supports multiple incoming channels through its powerful Automatic Event Distribution feature. The PowerX2011™ telecom server offers a greater exhaustive range of advanced PABX features such as CTI, multi channel communication management (voice, fax, email, internet calls, web chat) and unified messaging (voice mail, fax and email). The traditional Public Automatic Branch eXchange or PABX is an automatic telephone switching network within a private enterprise. A traditional PABX system comprises a control box, master operator console and extension handsets. An operator is required to control the switchboard and physically connect incoming telephone calls to each extension. The main function of a traditional PABX is to extend the trunk lines of the company to a group of users (extensions). It focuses on incoming and outgoing calls. The PowerX2011™ telecom server is a sophisticated multi-channel telecommunication network that can effectively scale to meet the needs of any organization, regardless of size. Incoming communication is electronically channeled to the desired extension and no operator is required to man any central control switchboard. The traditional PABX system is a dedicated phone network system. In order for the traditional PABX solution to offer features such as voicemail, interactive voice response (IVR), automatic call distribution (ACD), reporting and call accounting, it requires third party subsystems to be connected to the main PABX box for each of these features. Each of these subsystems requires its own set of hardware and software. This leads to duplication of hardware and resources. Resources include floor space, electricity, software like operating system, anti-virus software, PABX ports and extensions for connection purposes. For example, the company must purchase additional hardware such as special line cards for the ACD hardware, call queuing management system, hardware and software for the ACD. There may also be a requirement to upgrade the operating system of the PABX. These translate to higher initial and running costs. The company also ends up with more hardware and software than is required for each additional feature desired. This adds to the incurring of unnecessary expenditure for the additional features. The PowerX2011™ telecom server is an all-in-one system. There is no subsystem involved. All features are integrated into the same system.. The company does not need to pay for duplicate hardware and resources. The traditional PABX solution consists of a PABX box connected with third party subsystems such as voice logger, voicemail, interactive voice response (IVR), call sequencer, statistical reporting system and call accounting. Feature for feature, the PowerX2011™ telecom server is at least 50% more attractively priced compared with the traditional PABX solution. The additional routing due to the external nature of the subsystems and the resultant delays results in the company spending more costs in terms of power consumption, maintaining complex and additional multi vendor infrastructures, hardware and software, hiring more agents and subscribing to more trunk lines. The elimination of delays translates to huge savings in the hiring of additional agents and subscription of trunk lines. There is only one system to maintain so it saves costs for the company in terms of power consumption and maintenance costs. The add-on subsystems and the main PABX system are from different vendors. Hence a multi-vendor environment is created. Maintenance costs are higher due to the need to support the main PABX system as well as the add-on subsystems. As each add-on subsystem comes from a different vendor from the main PABX system, they cannot be fully compatible with each other. As a result, the company cannot maximize the enjoyment of all the features each subsystem can offer. There is no compatibility issue (that is, 100% compatible) as the hardware and software are built ground up to match each other in the PowerX2011™ telecom server. The traditional PABX, on its own, is a dedicated phone network. It only serves to connect incoming calls from trunks to internal extensions and outgoing calls from internal extensions to trunks. Even today, most PABX solutions still do not have all the comprehensive features offered by the PowerX2011™ telecom server in one platform. The PowerX2011™ telecom server is able to provide advanced features such as CTI (Computer Telephony Integration), multi-channel communication management (voice, fax, email, internet calls, web chat) and Unified Messaging (voicemail, fax and email). Unlike the multi-vendor environment of the traditional PABX solution, the features are built into the system. In the traditional PABX solution, CRM and ERP applications are third party software. Any linkages have to be carried out through third party interfaces. The PowerX2011™ telecom server has a built-in interface which can link to any ODBC-compliant CRM/ERP system to deliver services such as screen popups, reading and updating of transactions for example account balance, etc. The traditional PABX is mainly designed to handle voice calls only. The PowerX2011™ telecom server is designed to manage multi-channel communication. This includes voice call, voice-over-Internet-Protocol, SMS, fax, email and web chat. It allows for multi-channel broadcasting and notification services too. It also supports multiple channels through the AED (Automatic Event Distribution) feature. As the traditional PABX system has to bundle with third party hardware and software in order to offer advanced features such as ACD, the extent of integration and equipment to be purchased is subject to constraints from both systems. For instance, the third party ACD can only work with special line cards and call sequencer to connect the automatic call distribution system to the main PABX system. Hence purchasing a third party subsystem alone is insufficient. It also entails purchasing of other auxiliary equipment/hardware (could also be third party) to enable it to work with the PABX. All features such as ACD form part of the PowerX2011™ telecom server so no other hardware or software is required. After spending all the additional money to add on the capabilities of the subsystem, there is still no assurance that the configuration would generate optimal results. As a general rule, running multi-vendor, multi-system solutions normally result in a drop in the quality of service, difficulties in upgrading and limited flexibility in configuration. The quality of service provided by PowerX2011™ Telecom Server is higher and the solution is generally more robust. This is because there is no reliance on multi-vendor, multi-system solutions. The external nature of the subsystem in a traditional PABX solution poses some issues which affects the reliability of the overall system for example subsystems which require real time data. The data which the PABX sends to the Call Accounting subsystem and any reporting subsystems, for instance, is based on real time.If the subsystem is down, it cannot receive the data and the data is lost forever. To overcome this problem, third party systems are installed as buffer boxes to collect any overflow data. Once the buffer is full or if the buffer system fails, data is lost again. The system failure may go unnoticed until it is time for the administrator to collect routine reports or call accounting data from the subsystem and this usually only occurs at the end of the month. By then, the lost is too great! The PowerX2011™ telecom server provides automatic back-ups. Its also has built-in notification options and offers a list of communication channels for alerts to be sent. In the traditional PABX solution, each subsystem is an external entity from the main PABX system. It connects to the ports in the main PABX system via extension lines. This strains the already limited resources in the main PABX system. As more features are offered, more cards need to be added to the PABX to cater to the increased requirements. There are limited ports and card slots on the PABX. When the available card slots are used up, PABX expansion modules (boxes) need to be added to provide more ports and extensions. Unfortunately not all PABX can be expanded. In such cases, the entire PABX system has to be revamped and replaced with a new PABX system which can support a higher capacity. Besides incurring costs for the purchase, installation and commissioning of a new PABX system, the user has to incur costs to remove the existing PABX system off site. When this happens, the existing PABX system becomes a white elephant and new proprietary equipment such as handsets have to be purchased for the new telephone system. Proprietary handsets are usually costly. For the PABX systems which can be expanded, there is always a ceiling to the total number of extensions it can provide. Once the limit is reached, the system has to be revamped and replaced too. Hence such systems do not scale easily. The PowerX2011™ telecom server is scalable up to 5,072 ports. The traditional PABX solution is a hardware-driven solution. In order to offer features such as ACD, hardware such as call sequencer (complete with accompanying software) need to be installed as external subsystems to tap onto the main PABX system. Each PABX main system consists of limited card slots for each type of cards. To evaluate whether a particular feature can be offered, it also depends on, amongst other factors, the number of available card slots for, say, ACD in the existing PABX. There are also physical restrictions as to how many agents each card can support. For example in the case of ACD, at the very best, each special card can only cater to a maximum of 25 agents. If the Contact Center has 101 agents, it needs to purchase 5 line cards, which translates to a whole line card for the last agent. This means higher costs and less flexibility for expansion. Another setback is that each card can only support one workgroup. Thus, if you have two workgroups, you will need another card even when there are enough leftover extensions in the first card to cover the second workgroup. There are no restrictions on the available voicemail ports, conversation recording ports, ACD workgroups/members and IVR menus. There are also no limitations on the number of extensions or agents that can be created per workgroup. This represents a huge savings in initial investment and subsequent maintenance costs. The traditional PABX system is normally closed to users, that is, it is a ‘black box’ to them. Most warranties specify that companies (users) are usually not allowed to ‘touch’ the PABX equipment. These equipment are usually stored in a dedicated locked room within the company premises and the key is kept by the PABX vendor. Alternatively the equipment is housed in a locked cabinet with the key kept by the PABX vendor. There is heavy reliance on the PABX vendor to carry out all configurations to the system regardless of simplicity. For example adding a new member to an existing ACD workgroup can only be done by a qualified technician supplied by the PABX vendor. This translates to higher maintenance costs as such services are usually chargeable. The cost increases when more than one system is involved. Time to deliver is also subject to the availability and schedule of all technicians involved. There is less reliance on the vendor to implement minor changes to the PowerX2011™ telecom server system configuration. The graphical administrative interface empowers any trained IT staff/administrator to make changes to the system configuration, design new IVR menus, etc through a series of mouse clicks within a few minutes. The product lifespan of the traditional PABX system is limited. The features are usually hardware based. Any upgrade involves additional hardware which translates to additional costs. The maintenance for the PowerX2011™ telecom server covers software upgrades. All customers enjoy the latest available software features and this increases the lifespan of the system. Users of traditional PABX systems are locked in to the use of proprietary equipment supplied by the PABX manufacturer. Due to their proprietary nature, they tend to be exclusive and expensive. One example is the phone handset. The proprietary handsets supplied for a particular PABX model may not always be compatible with another range even when both PABX systems are supplied by the same vendor. Imagine the cost if all the handsets have to be replaced in order to upgrade to a PABX of higher capacity when the company expands! The PowerX2011™ telecom server is built on market available standards such as MS Windowsâ based interface, Crystal Reportsâ, ODBC compliant databases for the CTI, and standard analog telephone handsets. Using the handset as an example, imagine the amount of savings a company can gain! The handset is the most commonly used equipment in any telephone network. If a company has 100 extensions, it would usually need 100 handsets. As this is a hardware-based solution, upgrading can be both costly and complicated. Growth is also confined to the hardware constraints of the limited proprietary resources. Software upgrades to the subsystem and PABX are normally chargeable. The company can carry out its own configuration for any expansion via the user-friendly GUI and windows® based administrator application. The traditional PABX solution is difficult to customize due to the multi-vendor environment. Changes to one subsystem may impact the main PABX system and other subsystems. More than one vendor may be involved and additional coordination efforts are required from the company (user) in order to effect a change. This translates to additional costs for the company. The PowerX2011™ telecom server's design is modular and based on open system standards. This allows tremendous flexibility in customization. The external subsystem may not have all the features offered by the PowerX2011™ telecom server. For example, the third party ACD in the traditional PABX solution can only provide limited call distribution rules. There is only one routing rule for most traditional ACDs. This rule is on a "first-come-first-served" basis. The PowerX2011™ telecom server is able to offer many options for each of its features. For example, for ACD, there are numerous call distribution parameters available and changes can be made from time to time to select the most appropriate call distribution parameters. Examples include "most idle first", language preference, "lease talk time", etc. As an integrated solution, it is able to offer greater flexibility and more complex options such as the capability to handle complex inbound calls based on the extensive call distribution rules. Some of these rules are impossible to program in a traditional PABX with an ACD add-on. As each subsystem is external to the traditional PABX system, additional routing is required to connect each subsystem to the PABX. This results in delays in system calls or data transfers as the longer distance require more data traveling time. As features are offered through external sub-systems in the traditional PABX solution, the performance of these features are also affected. For example in the case of ACD, when a call is received, it is answered by the main PABX system and is placed on hold. The PABX system then checks with the external subsystem to find the next available agent. In order to do this, the ACD system has to poll the status of every agent until the free agent is found. Once the available agent is located, the ACD system releases the 'hold' facility on the call and does an internal transfer to the agent's extension. This round-trip of checking and transferring incurs a waiting time for the caller. Note that this waiting period can range from 20 to 30 seconds per call. The PowerX2011™ telecom server is a fully integrated all-in-one system managed by the smart IntelliMatriX™ engine. System calls and data transfers take a much shorter route as all components are within the same system. Thus they move faster. The modules in the PowerX2011™ telecom server also have instantaneous access to the latest system parameters like number of available agents, updated call traffic information and queuing parameters. There is no need to poll the availability status from a third party system. Using ACD as an example, there is no need for the system to check on the availability of agent before applying the appropriate call distribution rule. The IntelliMatriX™ engine in the PowerX2011™ Telecom Server keeps track of the status of every available extension. For Contact Centers that span geographical regions, every one of the IntelliMatriX™ engine in each location has instantaneous update of the status of every extension in the distributed Contact Centers. This results again in seamless and very fast response whenever the ACD is distributing an incoming call. The PowerX2011™ telecom server is able to transfer a call based on call type information without the need to answer and hold the call. From the above, we can safely conclude that the speed of distributing an incoming call is significantly faster using the PowerX2011™ telecom server compared with the traditional PABX multi-vendor environment. Information displayed to the agents and workgroup normally consists of LED displays, basic call statistics reports and optional agent consoles. The modules in the PowerX2011™ telecom server have instantaneous access to the latest system parameters like number of available agents, updated call traffic information and queuing parameters. The information can be displayed on LED, LCD or even over the Internet. In addition, the PowerX2011™ telecom server supports extended caller ID information. This means that information like number of callers in queue, workgroup voice mail etc. can be transmitted and displayed on standard Caller ID handsets. In the event of physical relocation of a major division, it is not possible to split up a traditional PABX system into multiple smaller PABXs. Additonal costs need to be incurred to purchase an additional PABX system to support that division. In the case of the PowerX2011™ telecom server, the telecom servers in the Main Building and Annex can function as one PABX system or split into a few independent systems. In the event of physical relocation of a major division, say 40% of the existing capacity is moving, the servers can be split up into more than one PABX system. There is no need to purchase an additional PABX system to support the division that is relocating. Each subsystem in the traditional PABX solution is connected externally to the main PABX system via a series of extension or data port cables. As more and more features are offered, the labyrinth of cables becomes more and more complex. When the system fails, it requires more effort on the part of the administrator to navigate around the complicated network of cables and subsystems and finally locate the source of the problem. The traditional PABX solution is also based on a multi-vendor environment. When fixing a problem in one area in the traditional solution, consideration must be given to its impact to the rest of the subsystems in the coalition. In the event of system failure, the response time to restore the system back to its working state is comparatively slower as this process may involve different vendors and multi-system configurations. In the event of any physical damage to the PABX and various subsystems, it may take more than one day to for the traditional PABX system to recover. This is due to the complexity in setting up a traditional PABX and integrating the various subsystems. The PowerX2011™ telecom server is a fully integrated all-in-one system. There is no need to search through a labyrinth of cables and nodes to identify the source of a problem. There is is also no third party vendor and system to contend with when carrying out fixes. In the event of system failure, the response time to restore the system back to its working state is comparatively slower as this process may involve different vendors and multi-system configurations. In the event of any physical damage to the PABX and various subsystems, it may take more than one day to for the traditional PABX system to recover. This is due to the complexity in setting up a traditional PABX and integrating the various subsystems. The PowerX2011™ Telecom Server is very compact and highly portable. In the event of system failure, GrowHill’s technical support team will physically bring in a temporary system, restore the most recent configuration and replaces the existing system within a few hours. call management during office hours, after office hours and on public holidays. With the intelligent scheduler, it is possible to program the call management to behave differently every other second. snooping/online monitoring (trunks, extensions, groups) including monitoring key performance indicators such as abandoned calls, response time, duration of calls-on-hold, etc. call statistics reporting which identifies the usage, call traffic, duration, response time, abandoned calls, monitoring of working hours and login-logout with reason codes by extension, department and company (available real time online with option to print), graphs and much more. enhanced capabilities of the business by providing communication infrastructure to pursue telemarketing activities, customer contact centres and 24 x 7 x 365 round-the-clock customer self-service centers. Copyright © 2019 GrowHill International. All rights reserved.